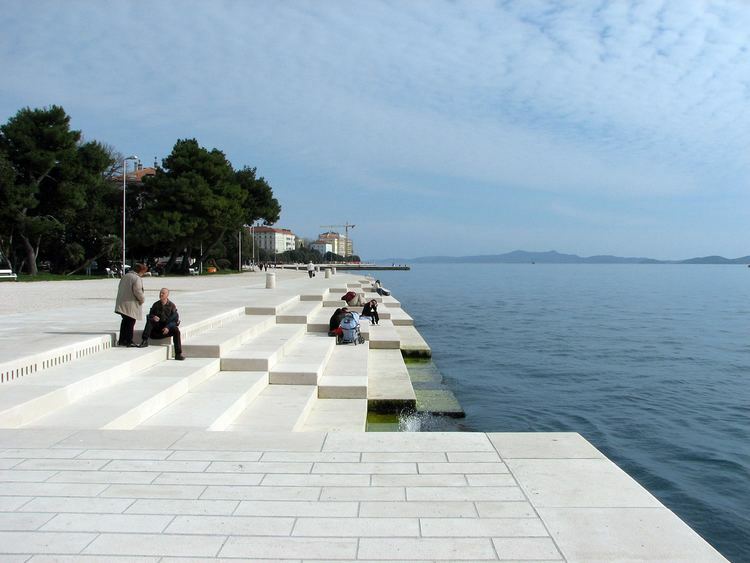 Zadar ([zâdar]; see other names) is the oldest continuously inhabited city in Croatia. It is situated on the Adriatic Sea, at the northwestern part of Ravni Kotari region. Zadar serves as the seat of Zadar County and the wider northern Dalmatian region. The city proper covers 25 km2 (9.7 sq mi) with a population of 75,082 in 2011, making it the fifth-largest city in the nation. The area of present-day Zadar traces its earliest evidence of human life from the late Stone Age, while numerous settlements have been dated as early as the Neolithic. Before the Illyrians, the area was inhabited by an ancient Mediterranean people of a pre-Indo-European culture. Zadar traces its origin to its 4th-century BC founding as a settlement of the Illyrian tribe of Liburnians known as Iader. With the 1920 Treaty of Rapallo Zadar fell under Italian rule, and after World War II, during which it was heavily destroyed by the Allies, it was brought back to Croatia whose armed forces defended it in October 1991 from the Serb rebels who aimed to capture it. In the Dalmatian language, Jadra (Jadera) was pronounced Zadra (Zadera), due to the phonetic transformation of Ja- to Za-. That change was also reflected in the Croatian name Zadar (recorded as Zader in the 12th century ), developed from masculine Zadъrъ. An ethnonym graphic Jaderani from the legend of Saint Chrysogonus in the 9th century, was identical to the initial old-Slavic form Zadъrane, or Renaissance Croatian Zadrani. Zadar faces the islands of Ugljan and Pašman, from which it is separated by the narrow Zadar Strait. 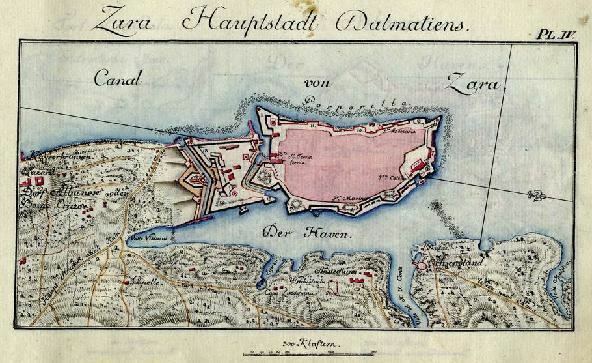 The promontory on which the old city stands used to be separated from the mainland by a deep moat which has since been filled. The harbor, to the north-east of the town, is safe and spacious. Under Italian rule, the Croatian population was subjected to a policy of forced assimilation. This created immense resentment among the Yugoslav people. The Yugoslav Partisan movement took root in Zadar, even though more than 70% of population of Zadar was Italian. In late October 1944 the German army and most of the Italian civilian administration abandoned the city. On 31 October 1944, the Partisans seized the city, until then a part of Mussolini's Italian Social Republic. At the start of World War II, Zadar had a population of 24,000; by the end of 1944, this had decreased to 6,000. Though controlled by the Partisans, Zadar remained under nominal Italian sovereignty until the Paris Peace Treaties that took effect on 15 September 1947. The Yugoslav People's Army (JNA) and forces of the SAO Krajina occupied parts of Zadar's hinterland, converged on the city and subjected it to artillery bombardment during the Battle of Zadar. Along with other Croatian towns in the area, Zadar was shelled sporadically, resulting in damage to buildings and homes as well as UNESCO protected sites. A number of nearby towns and villages were also attacked, the most brutal being the Škabrnja massacre in which 86 people were killed. Zadar was, along with Split and Dubrovnik, one of the centers of the development of Croatian literature. The 15th and 16th centuries were marked by important activities of Croatians writing in the national language: Jerolim Vidolić, Petar Zoranić (who wrote the first Croatian novel, Planine), Brne Karnarutić, Juraj Baraković, Šime Budinić. Since 1966, a railway has linked Zadar with Knin, where it joins the main railway from Zagreb to Split. However, passenger trains between Knin and Zadar are replaced with the buses that run in organization of national railway company. Zadar also has an international ferry line to Ancona in Italy. Ships also connect Zadar with islands of it's archipelago from two ferry ports: one located in the town center serving catamaran services and other one located in the suburb of Gaženica serving ferry and distant services. Zadar International Airport is located in Zemunik, around 14 kilometres (9 miles) to the east of Zadar and accessible via the expressway. The airport is experiencing year on year an average of 30% increase in passenger traffic mainly due to arrivals of lowcost carriers (Ryanair, Germanwings, InterSky, JobAir, etc) connecting Zadar from the end of March through October with over 20 cities throughout Europe. The basketball club is KK Zadar, the football club NK Zadar, and the local handball club RK Zadar. The bowling club Kuglački klub Zadar is also very successful. Zadar is also the hometown of Croatian handball player Ivan Ninčević and football player Luka Modrić and football player Danijel Subašić.